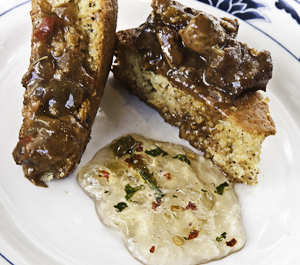 This recipe combines two Louisiana favorites with distinct flavors. 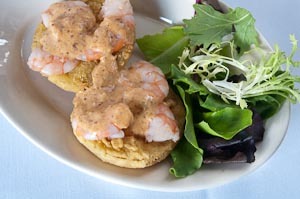 The tomatoes should be served warm or hot, while the shrimp and remoulade sauce should be cold for contrast. You can substitute crawfish, scallops, or even lobster for the shrimp, or eliminate them and serve the remoulade sauce directly on the tomato slices for a vegetarian alternative. 1. Whisk together egg and buttermilk in a medium bowl. Combine cornmeal, salt, and pepper in a shallow dish. Dip tomato slices in egg mixture, then coat with seasoned cornmeal. 2. Heat oil in a large sautÃ© pan over medium heat. Place tomato slices in pan in a single layer, and cook until golden brown on bottom, about 3 minutes. Flip and brown other side, about 3 minutes more. Interior should be cooked through but not mushy. 3. Place 2 tomato slices on each of 4 serving plates and top each slice with 3 shrimp. Spoon 1 1/2 tablespoons Remoulade Sauce over each slice, and garnish, if desired. Serve immediately. 1. Stir together first 10 ingredients in a bowl. Taste and add salt as needed. 2. While whisking mixture, add olive oil in a slow stream. Add celery and next 3 ingredients; stir well. Add a few drops of hot sauce if spicier flavor is desired. Sauce should be spicy and tangy. Cover and refrigerate up to 3 weeks. 4 cups coarsely chopped roasted duck or chicken meat. 1. In a heavy-duty casserole over medium-high heat, heat oil and whisk in a sprinkling of flour. Continue to sprinkle in the flour until it is all used, whisking vigorously so that mixture is smooth and does not burn. Continue to whisk until mixture is a very dark brown color but is not burned; this may take 10 minutes or more. 2. Reduce heat to low and add celery, onion, garlic, red bell pepper, green bell pepper and parsley. Stir to mix well. Add black pepper, thyme, bay leaves, salt and cayenne pepper. Add stock a cup at a time, stirring well after each addition. 3. Add tomato paste and sausage, raise heat to medium high and simmer uncovered for 30 minutes, stirring occasionally. Add duck meat, and stir well. Simmer until heated through, about 10 minutes. Serve, if desired, over rice or cornbread.